It’s fun to explore the unique sonic flavors and textures of a nylon-string guitar. The Grand Auditorium 114ce-N serves up an inviting option, blending legendary Taylor playability with clear, balanced acoustic tone. The guitar is strung with D’Addario’s Pro-ArtÃ© Carbon Hard Tension strings, which feature carbon treble strings and Dynacore composite core bass strings. These blend the musicality of a traditional gut string with a richer, louder modern voice that players will love. 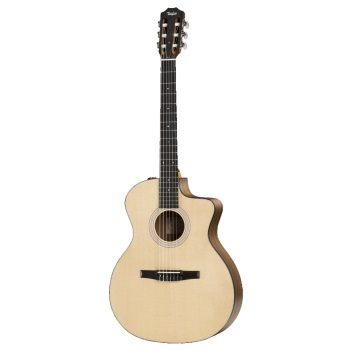 The guitar’s layered walnut back and sides are paired with a solid Sitka spruce top, and modern amenities include a cutaway and onboard ES-N electronics, plus a convenient gig bag for easy portability. However you plan to use it, a nylon-string guitar will make an inspiring addition to your acoustic toolbox.